Your guide to a festive weekend. While the St. Patrick’s Day parade went down last weekend, the actual holiday is still ahead of us. Which means, yep, we’ve got another weekend to fill with festivities. If you’re ready to rally, here are some suggestions for places you can put on green and party this weekend. I know I’ll be wearing green — my mom always calls to make sure. The St. Patrick’s Day pub crawl is a tradition as old as U2. You get a special t-shirt or headpiece or wristband and you meander around town enjoying cheap drinks. Ready to go? We found four throng-based events going on this weekend. They’re all kind of… samey? Is that okay to say? All pub crawls look alike to me. But one has the audacity to call itself “official.” That’s bold. Shamrock Crawl, Saturday & Sunday, noon-2 p.m., $9.95-$14.95 (one ticket gets you both days), 60 (?!) participating locations downtown. St. Patrick’s Day Bar Crawl Manayunk, Saturday, noon-8 p.m., $5-$20, includes “green swag” like t-shirts, beads, etc., six participating locations in Manayunk. St. Patrick’s Day Philly Official Bar Crawl, Saturday, noon-8 p.m., $14.95-$20, includes some of that aforementioned “green swag,” 20+ locations downtown. 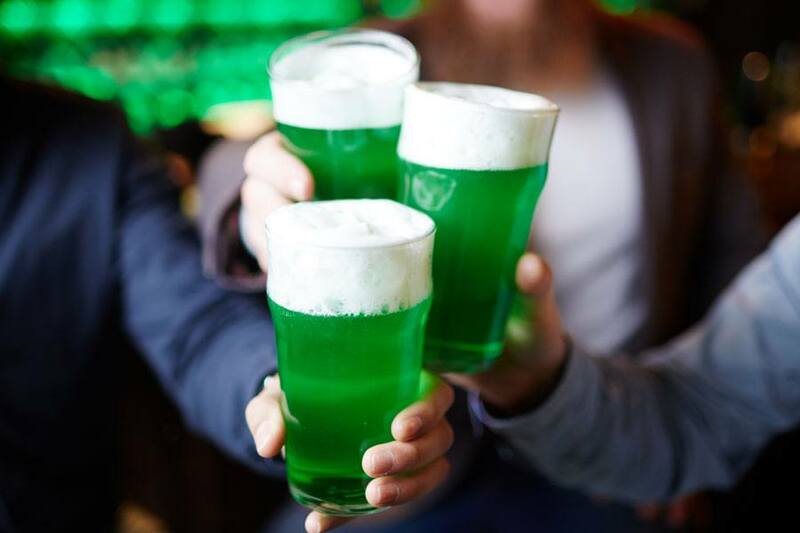 Kiss Me, I’m Irish: Philadelphia St. Patrick’s Day Bar Crawl, Sunday, 11 a.m.-2 a.m., $20-$60, six participating locations in Center City including McGlinchey’s, which will sell you a pint of green beer for $3. Of course, you don’t actually need to wander around from place to place. Pretty much any bar in town would love for you to drop by and settle in for awhile. There are plenty of musical options, too. With the possible exception of the one at the Annenberg, you can probably have a drink or two while you’re at it. Seamus Egan Project, the veteran musician and founder of Solas performs with members of the Anna Crusis Women’s Choir, Friday, 7 p.m., $25-$38, World Cafe Live Philadelphia, 3025 Walnut St.
Saint Patrick’s Day Weekend, three days of live music and heated tents, Friday-Sunday, Nick’s Roast Beef at Katie O’s, 4501 Woodhaven Rd. West. St. Paddy’s Day at Springfest Live! at Xfinity Live!, (exclamation points theirs) live music and beers from more than 75 breweries, Saturday, 2-6 p.m., $45, Xfinity Live!, 1100 Pattison Ave.
St. Paddy’s Day Sip and Shop, drink, shop & raise money for the Bridesburg Cougars Cheerleading program. Saturday, 2-6 p.m., free to enter, pay as you go, Point No Point, 2843 Orthodox St. Shamrocked!, Saturday, keep it like a secret. Barleyjuice, pan-celtic rock band with good rep, Sunday, 7 p.m., $20, World Cafe Live Philadelphia, 3025 Walnut St.
Saint Patrick’s Day Happy Hour with the 29ers, alt-country music, Sunday, 4-7 p.m., 118 North, 118 North Wayne Ave., Wayne, PA.
St. Sunday Paddy’s Funday with the Boatloads, live music and fun with an eye on the TVs to see how March Madness shakes out, Sunday, 4-8 p.m., free, Conshy Corner Tavern, 600 E. Hector St., Conshohocken, PA. Kiss Me I’m Irish & Gay, “the Official Gayborhood St. Patrick’s Day Party,” Sunday, 2-5 p.m., $20, Ubar, 1221 Locust St.
Michael Londra and the Celtic Fire, traditional Irish music and dance, Sunday, 8 p.m., $29-$49, Annenberg Center, 3680 Walnut St.
St. Patrick’s Day Metal Massacre, DJ GR/EG spins metal records, Sunday, 8 p.m., free, Johnny Brenda’s, 1201 N. Frankford Ave.
Or maybe you’re looking for something a little quieter, a Philadelphia St. Patrick’s Day celebration without any drinking. A movie, perhaps? Well, the pickings are slim but they’re still pickings. And all the pickings are at the same place. Jennifer Aniston and Warwick Davis star in The Luck of the Irish… Just Ran Out! It’s easy to make fun of this 1993 horror flick, but let’s take a moment to count our blessings. If Leprechaun had come out in the 2000s it would’ve been an intentionally silly, CGI-heavy SyFy type deal, not the start of an amusing multi-part franchise that includes Leprechaun in the Hood. Not to mention Leprechaun: Back 2 tha Hood. Saturday, 7-9 p.m., $5, South Street Cinema, 327 South St.
Return to South Street’s little, lovable theater for some holiday appropriate fair that doesn’t involve murder. I think. First, there’s High Spirits, Neil Jordan’s 1988 haunted house comedy starring Darryl Hannah, Peter O’Toole, Steve Guttenberg, and so on. Then comes The Commitments, a heartwarming drama-comedy from 1991 about a soul band in Dublin, Ireland. Stars Glen Hansard, Colm Meaney, Andrea Corr, etc. Sunday, 4 & 7 p.m., $5, South Street Cinema, 327 South St.